National security adviser Condoleezza Rice on Thursday defended White House terrorism policy prior to Sept. 11, telling a commission that al Qaeda was a top administration priority but "there was no silver bullet that could have prevented the 9/11 attacks." Rice blamed decades of foreign policy, domestic legal restrictions and bureaucratic logjams for slowing the federal response to terrorism. But she clashed with some members of panel investigating the 2001 attacks who questioned whether the White House responded to pre-Sept. 11 reports that may have given hints of the terrorist plot. Rice's testimony, which was televised nationally, was seen as an effort to rebut claims by former counterterrorism director Richard Clarke, who claims the Bush administration in general — and Rice in particular — ignored his warnings about al Qaeda and Osama bin Laden. The White House said Mr. Bush watched all of Rice's testimony. Mr. Bush thought that Rice "did a terrific job," the White House said, and that she articulated "the responsible actions the administration took before Sept. 11 and the aggressive actions the administration took after Sept. 11." A CBS News poll found Rice's testimony improved her public image, but left most Americans — three in four — suspicious that the Bush administration is hiding something. Clarke's claims have fueled a debate over whether Clinton administration gave the Bush team a plan to fight al Qaeda, and whether the Bush administration gave enough attention to terrorism. 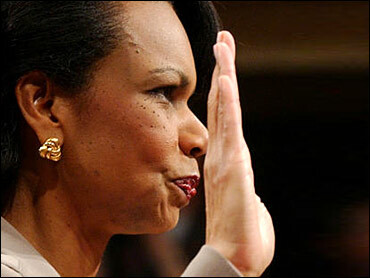 Rice said she and President-elect Bush received from the Clinton administration two briefings on terrorism. After becoming president, Rice said Mr. Bush's daily intelligence briefings touched on al Qaeda at least 40 times, occasionally in response to a question he or an aide asked. "President Bush understood the threat, and he understood its importance," she said. "He made clear to us that he did not want to respond to al Qaeda one attack at a time. He told me he was "tired of swatting flies.'" Rice argued that the Bush administration confronted long-standing flaws in U.S. counterterrorism strategy, like a lack of domestic intelligence gathering. "America's response across several administrations of both parties was insufficient," Rice said, adding, "tragically, for all the language of war spoken before September 11th, this country simply was not on a war footing." But Democratic commissioners wondered if the Bush team acted on warnings it received in the summer of 2001. Commissioner Richard Ben-Veniste engaged in a testy exchange with Rice over one pre-Sept. 11 intelligence report — the president's Aug. 6, 2001 presidential daily brief. Rice said the briefing did discuss the threat of a hijacking, but took a historical view and did not say that airplanes might be used as missiles. "It did not warn of attacks inside the United States," Rice said. "It did not in fact warn of any coming attacks inside the United States." But Ben-Veniste pointed out that the title of the report was "Bin Laden determined to attack inside the United States." Prompting a crackle of applause, Ben-Veniste asked if Rice had told Mr. Bush that the FBI believed there were al Qaeda cells inside the United States. "I really don't remember whether I discussed this with the president. I don't remember that the al Qaeda cells were something we were told we had to do something about," she said. "The president knew that the FBI was pursuing this issue. The president knew the director of the CIA was pursuing this issue." Commission chairman Thomas Kean said the panel would press to get the Aug. 6, 2001 brief declassified. Commissioner Bob Kerrey suggested that had action been taken on an FBI memo warning that militants may have been training at U.S. flight school, "the game would have been over." Rice disagreed. She said the FAA and FBI issued warnings based on the threats before Sept. 11, but that the warnings were not specific. Earlier, Rice told commissioners that the Bush administration had pursued a "parallel track" against terrorism before the attacks: adopting some policies that the Clinton administration imposed or considered, while developing "a new and comprehensive strategy to eliminate the al Qaeda terrorist network"
Rice said the new strategy — calling for diplomatic efforts, covert action and the preparation of military plans — was developed in the spring and summer of 2001 and approved by the president on Sept. 4, 2001. Asked how the Bush administration's military plan differed from a similar Clinton administration strategy, Rice said the Bush version placed the threat of force within a diplomatic context — like getting Pakistan's help — that would have made force possible. In several reports issued during earlier hearings, the commission has already said that both the Clinton and Bush administration's pursued mainly legal and diplomatic ways of beating al Qaeda, and failed. Rice's sworn testimony could have significant implications for Mr. Bush's re-election campaign, which relies to a great extent on his national security credentials. Rice did not apologize to victims' families, as Clarke did. She thanked them for assisting the commission, and discussed her own feelings of anger over the attacks. "I've asked myself a thousand times what more we could have done," she said. "If we knew that an attack were coming on Washington or New York, we would have moved heaven and earth to try to stop it." Clarke has asserted that in the wake of Sept. 11, Mr. Bush pressed his aides to link the attacks to Iraq. Rice denied that. "It was a reasonable question to ask whether Iraq could have been behind this," Rice said, and denied Mr. Bush asked anyone to "twist the facts."